Figure-8 Circuit as it appears in Smash. For the stage that originated in Super Smash Bros. for Wii U, see Mario Circuit (SSB4). Figure-8 Circuit (エイトクロスサーキット, 8-Cross Circuit), originally referred to as Mario Circuit (マリオサーキット, Mario Circuit), is a playable stage in Super Smash Bros. Brawl, Super Smash Bros. for Wii U and Super Smash Bros. Ultimate. In SSB4, it was renamed to Mario Circuit (Brawl) to distinguish it from the similarly named new stage. In Ultimate, it was renamed again to its current name to further distinguish it from the aforementioned SSB4 stage that is also in Ultimate, and due to its strong resemblance to the track from Mario Kart DS. In Ultimate, Daisy is fought here for her unlock battle. The stage has a simple layout, being a walk-off with solid ground making up the base of the stage. There are three soft platforms above it, arranged in a trapezoid shape, with the platforms on the sides being walk-offs as well. At regular intervals, Shy Guys in go-karts will drive from the background on the lower road, similar in concept to the F-Zero-themed stages Mute City and Port Town Aero Dive. Some time later, they will fly over the platforms on the upper road from the left, though players are alerted beforehand by a flashing warning arrow, akin to Onett. If players are hit by the karts, they will take 15% damage and sizable knockback, and can even be Star KO'd at higher percentages. The Shy Guys can also be attacked, which will send them spinning out to the side of the screen. Additionally, the screen in the background shows the location of the Shy Guys on the circuit, providing extra warning for their arrival. In Super Smash Bros. for Wii U, the Ω form of this stage consists of a new, raised platform in front of the standard version of the stage, which can be seen in the background. Shy Guys still race along the track but do not interfere with the fighters. In Super Smash Bros. Ultimate, the Ω form and Battlefield form are similar to SSB4's Ω form; however, the stages hover above the racetrack, and they are sized and shaped to match Final Destination and Battlefield, respectively. The three soft platforms of the Battlefield form somewhat resemble the soft platforms of the normal form. Figure-8 Circuit as it appears in Mario Kart DS. 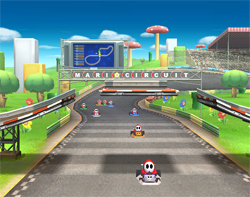 Mario Circuit is the name of a track that appears in every Mario Kart game since Super Mario Kart; however, the stage's design does not resemble any Mario Circuit in particular. It appears to take inspiration from Super Mario Kart's Mario Circuit 2, which has a jump that overlaps another part of the track. The distant, tall mushrooms and trees with faces are also taken from Mario Kart: Double Dash!! 's Mario Circuit. 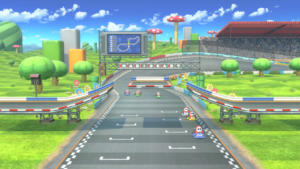 The overall design of this stage instead resembles Figure-8 Circuit in Mario Kart DS (which it is named after in Ultimate). Figure-8 Circuit features a seating area for spectators, pipes in the background, and giant block structures (which originally appeared in Super Mario Bros. 3). All these features are retained in this stage, but Figure-8 Circuit only had one seating area, while this stage features two. Additionally, the large sign which reads "Mario Circuit" (or "Mario Kart", in Ultimate) is designed similarly to signs that appear throughout Figure-8 Circuit. Mario Kart DS and Mario Kart 7 feature Download Play, which allows players who do not own the game to participate in local multiplayer; however, Download Play restricts players to racing as a Shy Guy. This stage includes Shy Guys as racers, which could be a reference to this feature. 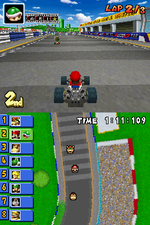 The design of the giant screen in the background is based on the map that was displayed on the Touch Screen during races in Mario Kart DS. Pressing the "Y" button or tapping the screen with the stylus gave the player this view, along with the location and position of every racer. All of these features are retained here, though the original star motif is replaced with a Smash logo motif. Mario Circuit is banned in tournaments due to its walk-off blast lines, which, in Brawl, allow chain-grabbers to chain throw an opponent off of the stage's sides. In addition, the karts are overly powerful stage hazards, and gameplay centers around avoiding the karts, as well as throwing opponents into them. While using Link or Toon Link's Triforce Slashes, if a Shy Guy is hit by the final strike and only the final strike of the Final Smash, the Shy Guy will continue to go around the circuit, but it will be in slow motion. It will still show the kart's position on the monitor in the background but it will be far behind the group. Even though it is moving so slow, it will still deal normal damage and knockback. The whole track as seen in Brawl. The Shy Guys on the track. The fighters moving away from the Shy Guys. Shy Guys hitting Bowser and Donkey Kong. Mario hitting a Shy Guy. Mario Circuit in Super Smash Bros. for Wii U.
Captain Falcon using Raptor Boost on the stage in Ultimate. Cloud performing his forward smash on the stage. Inkling inking the stage in Ultimate. Simon taunting alongside Young Link on the stage. Sonic nearly colliding with the Shy Guys on the stage. Added 8-Player Smash version of the stage and its Ω form. Lakitu giving the green light to begin a race in Mario Kart 8 Deluxe. This was the last stage that was first shown in trailers to be confirmed on the DOJO!!. Over a year had passed since its initial revelation, making Mario Circuit the stage with the longest duration between its trailer and DOJO!! confirmations. In the trailer that originally revealed Mario Circuit, the Shy Guys were all driving white karts and the screen in the background was blank. Some items and Final Smashes can't affect the karts on the track. When Iceberg is used, for example, the karts will simply drive straight through the ice. Cook Kirby also doesn't have any effect on them; this is because they are obstacles. They are also unaffected by Bumpers. If Andross is summoned from an Assist Trophy, the lower part of his face will be below ground. When the announcer gives the "GO!" signal in Brawl, the music track will begin to play and the Shy Guys will race around the course, much like Lakitu's role in the Mario Kart series to begin a race for the characters when the signal lights turn green. As pointed out on the DOJO! !, the entire track is present, despite most of it not being viewable, even when pausing and changing the camera angle. However, it can be viewed by hacking. POW Blocks are able to hit Shy Guys that are behind the stage. In SSB4, this is the only stage to have something other than "64" in parentheses in its name. In Ultimate, Sonic is the only character who travels to Figure-8 Circuit in his Classic Mode route. This page was last edited on April 23, 2019, at 00:22.